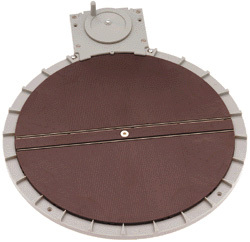 Fully assembled, 9" diameter turntable has the ability to stop at 21 positions, 15 degrees apart. Geneva movement locks table in exact position every time. Simulated wood brown turntable deck and concrete pit ring. Copy this Turntable to your MY ACCESSORIES roster.